One of the most time-consuming aspects of grooming is undoubtedly removing body hair. Shaving is probably the most tedious of them all, and while it’s relatively easy and convenient, it can also leave you with razor burn and ingrown hairs. Waxing means making an appointment, spending money, and being in certain levels of pain to get hair removed. Permanent hair removal is nice, but there are some risks associated with it, and it can get expensive. Checking out the best hair removal creams we have waiting for you, below! Now that you’ve taken a quick overview of each of the best hair removal creams, you’re probably interested in knowing more. Scroll down a bit further, where you’ll find in-depth, unbiased reviews of each of the above products! One of the most well-known names in at-home hair removal is Veet. Veet features a pretty extensive line of various hair removal creams for the face and body, and for regular and sensitive skin. We actually tried both, and the sensitive and regular ones worked just as well, so if you’re worried about it, just go with the sensitive skin version. Shaving can be annoying, let’s face it. You have to deal with shaving creams, risking razor burn or little cuts, and just the time in general, that it takes to shave! With that, you can probably see why hair removal creams are so appealing to many! If you used one a while ago, you may have been turned off of the idea, but the more recently-formulated ones are so much different, now. They don’t smell like a science lab, with that heavy chemical smell, and they’re much more gentle on the skin. When you first receive the product, you’ll see that there’s a weird little device with it. That’s a spatula, included for your convenience. It comes with a smaller and a larger end; a sharper and a duller end. That’s to remove the hair and cream once it’s done setting. Overall, it works well. It lasts longer than shaving and gets really close to the root. After trying it, we can confidently say that this is one of the best hair removal creams for its price range, on the market today. Make sure to apply the cream in a thick layer where you want to remove your hair. The cream is pretty thick in itself, so this shouldn’t be a problem. If you’re worried about your skin, don’t be. While the hairs are dissolving, the included Aloe Vera and Vitamin E are protecting and hydrating your skin. Leave it on for anywhere from 6-10 minutes (depending on the thickness/coarseness of the hair). At this point, you can either use a wet washcloth, or the included spatula, depending on your preference. Make sure you’re using the appropriate cream for your body parts. DO NOT use the body cream on your face! We can’t say this enough. The skin on your face is much more delicate and we can say with confidence, will not react well to the body hair version. Results show in just a few minutes, and you’ll have smooth, soft, and hairless skin after removing the cream! The results last up to 5 days, before you’ll start to see it growing again. Actually, that means it lasts longer than shaving, so if you have sensitive skin or are sick of ingrown hairs, give this a try! The spatula isn’t available with every single one, so pay attention to what you’re receiving! The Olay Facial Hair Removal Duo is the only product we recommend for using on your face to remove hair! The duo consists of a Skin Guarding Balm, and a Hair Removal Cream. They work in conjunction for the gentle removal or facial hair. Now, the packaging says it’s for medium-to-coarse hair, but we used it on lighter hair, and it worked well without any problems. Keep in mind, that this is only for the: upper lip, chin, cheek, and jaw areas, so don’t go trying to get rid of your unibrow! The balm works to protect the skin, and the cream is what removes the hair. Upon receipt of the package, we were pretty surprised at the size of the box that it came in! We were also surprised when we opened it up to see two pretty small tubes inside. That didn’t really make sense, but okay. It doesn’t smell like Nair…but it doesn’t necessarily smell “good”. You can still tell that it’s packed full of chemicals as it’s reflected in the smell, but they’ve tried masking it with a lemony scent which was super strong. The balm is scentless, which was nice. Let’s talk a bit more about the balm. It is kind of like Vaseline, to be honest. It’s a very odd feeling, but you can tell its purpose is to create a barrier between the product and your skin. Well, it definitely works, so no complaints there! Just rub it in for at least 20 seconds, and make sure to spread it out wider than the area you intend on treating. 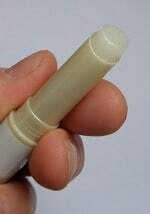 The cream application isn’t very simple, and takes quite a while to apply, as you don’t want to get it in your hair, near your mouth, or in your nose or eyes. Make sure you’re not rubbing this product in. You’ll want to leave it in for 6-8 minutes, depending on how you feel. It’s not necessarily easy to use, but the fact that Olay has made facial hair removal for women simpler than it was before, is definitely worth it. The biggest downside, is that if you have any kind of skin irritation, dryness, or acne, you definitely do not want to use this product, as it could aggravate it or even cause an adverse reaction. Moom is a bit of a different product, in that it’s technically not a cream, but it’s also not a wax or anything else we’ve seen before. It’s an organic hair removal system, made up of all-natural ingredients. It’s designed to remove hair, but also leave the skin feeling super soft and smooth by getting rid of any dead skin cells and impurities that may be hanging out on the skin. To use, you must heat up the Moom in the microwave. Spread the product with the stick, super thin over the area you want to rid of hair. 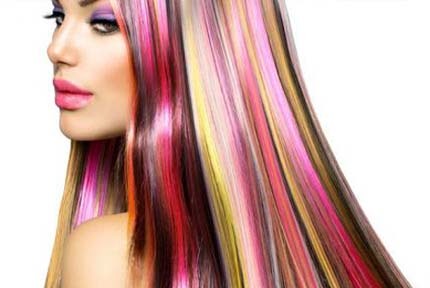 You want to get it as thin as possible and apply it following the direction of hair growth. Then, apply one of the washable fabric strips, and pull one end of the fabric up and off the skin. 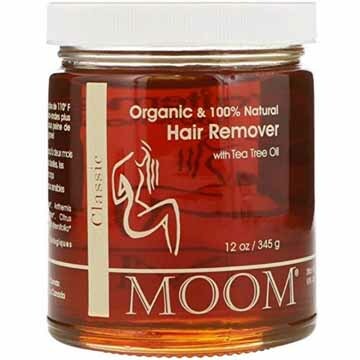 This hair removal product is USDA certified organic and can be used on any thickness of hair or any skin type. It can also be used on any part of the body, including the jawline of the face. Results last up to 8 weeks. We thought this product was going to be a bit different than we’d come to find out. While it’s not a wax nor cream, the process is more like waxing. The upside to this product over waxing is that it’s great for those with sensitive skin, as it’s not going to clog the pores or cause those red bumps that can be painful. It instead soothes and hydrates the skin. We loved that it worked well on literally every part of the body we wanted nice and smooth. There was absolutely zero irritation, which is still a bit surprising, but in a good way! Honestly, the results speak for themselves, and the fact that it’s all-natural and cruelty-free also speaks wonders about the company. Now, let’s talk about what we weren’t huge fans of. 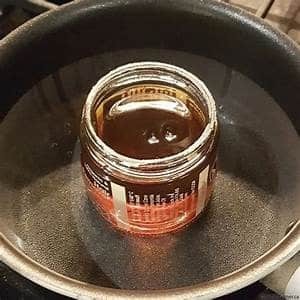 Think about putting honey all over your body. It’s pretty much like that. It’s definitely not for those mornings where you forgot to shave your legs and you have to put on a dress and just need a quick fix. Hair also needs to be at least ¼ of an inch to work. One of the best hair removal systems out there today is undoubtedly Nads. We fell in love with their Sensitive Hair Removal Cream for so many reasons! It’s a cream enriched with natural extracts of melon, Aloe Vera, Avocado Oil, as well as honey. They all work together to help soothe and protect the skin as your hair is being removed. In addition, the formula also has a unique Odor Elimination process, making it smell-free and painless. It’s great for all skin types, but those with sensitive skin will really appreciate this gentle formula. It does work in as little as just 4 minutes, so if you’re in a hurry, then this is a great option. Results are quick and painless, so no burning or redness to be seen! 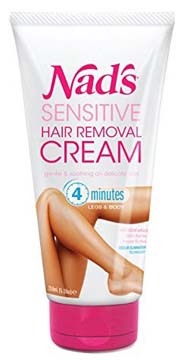 The Nads hair removal lotion is good, but it’s not our absolute favorite. However, we can definitely see the benefit for those with sensitive skin. It’s one of the few hair removal creams that is gentle enough to use for all skin types, and truly doesn’t cause any redness or irritation. The packaging claims that hair will be completely removed in as little as 4 minutes. That’s not exactly true; at least not in our experience. It was closer to 10 minutes, to be honest; if not more than that. And if we’re talking about the armpit area, make sure you completely wash any deodorant off before applying this cream. We read somewhere about this Odor Elimination Technology. We’re not quite sure what that was referring to, but it definitely wasn’t referring to the hair removal cream. While it doesn’t smell as strong as some other depilatory products, it still smells notably like a hair removal product. We will say, that it does do a good job of soothing and protecting the skin, however. The inclusion of natural extracts and oils really makes a difference. Our skin was silky smooth afterwards, and actually felt better than before we used the cream. This product is a little bit different from the rest, in that it’s more of a preventative measure to keep hair growth down, rather than a complete hair removal cream. The Barely There Don’t Grow There is a body moisturizer and hair growth inhibitor. It means that you’re going to see a reduction in your body hairs’ density; you could actually see a reduction in density by up to an impressive 50%, length by up to 30%, and growth up to 55%, after using the product twice daily, for 28 days. Imagine just using a lotion that reduces the overall appearance of your body hair, while simultaneously making your body feel super soft and hydrated. That’s essentially what the Barely There Don’t Grow There does. We’d like to preface this by saying we didn’t actually use it for the full 28 days, but rather a week and a half. The upside to that is that we actually did notice a pretty noticeable difference just after that short amount of time. We started out by shaving our legs, as we felt it would be kind of difficult to measure if our hair had already grown out. Typically, after a day or two, we would start to feel stubble growing back in, but in this case, it took almost a week for that to happen. This time around, the stubble was much lighter and less “pokey” feeling if that makes sense. The moisturizer itself is actually very thick, velvety, and luxurious-feeling. It’s a pleasure to apply the product and doesn’t smell all chemically, like most of the others on the market do. Rather, it smells like a soft lemongrass and green tea fragrance which is actually nice. The product is also relatively inexpensive, so if you’re looking to shave or wax less, then definitely use this in-between sessions. Your skin will thank you! Now that you’ve taken an in-depth look at each of the best hair removal creams currently out there, have you decided on the best one for you? If you’re still undecided or confused about which one to select, and why, then take a look at our buying guide, below. It will take you through each step of the buying process, so you have no doubts! When looking at hair removal creams, it’s extremely important to take your skin type into consideration. This goes double if you have very dry or sensitive skin. If you do have dry/sensitive skin, make sure to pay special attention to if the item you’re interested in will be gentle enough for you. There are specially-formulated hair removal products for sensitive skin. When in doubt, make sure to do a patch test on a small part of your skin to see how it reacts. Even more so, if you’re using a facial hair remover! That brings us to our next point, which is choosing which type of hair removal cream you need. Are you using it just for your body hair? Just for your facial hair? Both? There aren’t many out there that can do both well. We’d honestly recommend picking two individual products: one specifically for the body, and one for the face. This is just to be on the safe side. You definitely don’t want chemical burns on your body or face due to simple negligence. For the face, the only item we recommend is the Olay Facial Hair Removal Duo. Make sure to look at the pros and cons of every product to find the one you’re looking for. In general, people don’t want to use things that smell bad; especially not on their body. If you have a sensitive nose, pay special attention to this part! Hair removal creams are notorious for smelling bad. 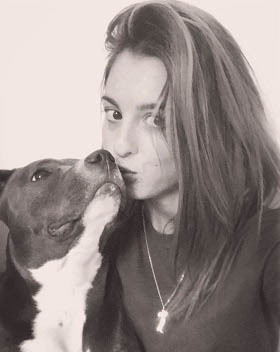 Even though there have been many strides made in the effort of making them smell better, or at least smell less, there’s still a lot of work to do. If we’re honest, most of the products in our guide smell pretty strong, and not necessarily good. In fact, the only one that we’d consider to be pleasant-smelling, is the Barely There Don’t Grow There Moisturizer and Hair Inhibitor. That’s probably due to the fact that it doesn’t completely remove hair. It’s important to decide on a budget before you go out looking for products to buy. Decide on a number and don’t go over that number. That way, you won’t have any buyer’s remorse, even if you do love the product. Hair removal creams are all generally pretty affordable, although they do vary when it comes to how long the product lasts. Some only require a bit of product, while others require thick layers of the product, and the whole tube will be used up within 10-20 uses. Make sure to read reviews to get a better idea of how much you’ll really be spending on such a product. Now that you’ve reached this part of the article, you probably know just about everything there is to know about hair removal creams. Well, at least everything your average person would want to know about them, at least! If you’re still undecided, we’d like to say how much we enjoyed the Veet Hair Removal Cream. 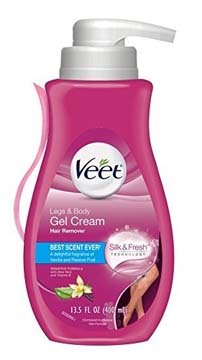 Veet is one of the biggest names in the household hair removal industry, and that’s proven through this product. It’s super easy to use, it’s gentle on the skin, and it actually works; and it works fast! Skin is left feeling soft, smooth, and hydrated, with no sign of irritation or redness. It comes with a convenient, little spatula for precision and for further ease-of-use. It lasts quite a long time, and is pretty inexpensive, too! If the Veet isn’t for you, not to worry! No matter which one of these you choose, you can rest assured that you’re receiving one of the best hair removal creams on the market today!